Salinger was an American author , who published four books, one of which was a compostion of short stories. 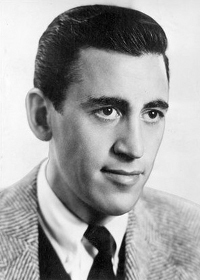 However, Salinger was known for two things: His reclusive nature and his best selling novel, The Catcher in the Rye. The book which was published in 1951, remains highly controversial and continues to sell upwards of 250,000 copies a year. What a week in popular media! There was President Obama’s first State of the Union address, the highly anticipated unveiling of the Apple iPad tablet computer, and the the once a year World Economic Forum in Davos, Switzerland. The World Economic Forum was founded in 1971 by Klaus M. Schwab, a business professor from Switzerland. The World Economic Forum is a non-profit buisness organization based in Geneva, Switzerland and is best known for its annual meeting in Davos, Switzerland. Beyond meetings, the Forum produces a series of research reports and engages its members in sector specific initiatives. The five day World Economic Forum in Davos, brings together over 2,500 people; mainly top business leaders, international political leaders, selected intellectuals, and journalists to discuss the most pressing issues facing the world including health and the environment. In 2006, the World Economic Forum opened regional offices in New York City and Beijing. With close to twenty key initiatives, here are a few of my favorites and more tha likely most talked about: Agriculture and Food Security; Humanitarian Relief; Disaster Resource network; and Global Risk network. Today, I am writing to help clear up some commonly heard, yet, misunderstood terms in finance. 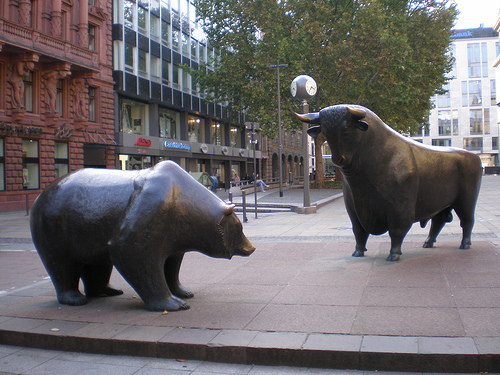 Most commonly the Bear and the Bull are referenced in regards to the stock market but these terms can be applied to anything that is traded, such as bonds, currencies and commodities. Things to consider: Bear markets rarely provide great entry points, as timing the bottom is very difficult to do. Fighting back can be extremely dangerous because it is quite difficult for an investor to make stellar gains during a bear market unless he or she is a short seller. A bear market has more sellers and lesser number of buyers. Bull Market -A financial market of a group of securities in which prices are rising or are expected to rise. A bull market is associated with increasing investor confidence, and increased investing in anticipation of future price increases capital gains. A bullish trend in the stock market often begins before the general economy shows clear signs of recovery. Things to consider: It’s difficult to predict consistently when the trends in the market will change. Part of the difficulty is that psychological effects and speculation may sometimes play a large role in the markets. In a bull market there is a low supply of securities and a high demand for the same. This is because few are willing to sell due to the rising trend of the market, expecting it to grow further. As a result, share prices soar high, as investors compete to buy the available equity. Wittgenstein was an Austrian-British philosopher who worked primarily in logic, the philosophy of mathematics, and the philosphy of language. Described by Bertrand Russell as “the most perfect example I have ever known of genius as traditionally conceived, passionate, profound, intense, and dominating,” Wittgenstein is considered by many to be the greatest philosopher of the 20th century. The Moka Pot, also known as a Macchinetta, is a stove stop espresso maker widely popular in Europe. The Moka was patented by Alfonso Bialetti in 1933, and his company ‘Bialetti’ continues to make the original ‘Moka Express’ to this day. The quality and conveinence of the espresso derived from the Moka is incredible. The Moka works on steam pressure and is very simple to use. The Moka is made of three chambers. The bottom is for water, the middle is for the espresso grounds, and the top is for collecting the fresh espresso post steaming. Try to use quality and fresh espresso grounds and purified water for the best tasting results.